Hi there Moda Bake Shop Bakers, it is LeAnne over at Everyday Celebrations. 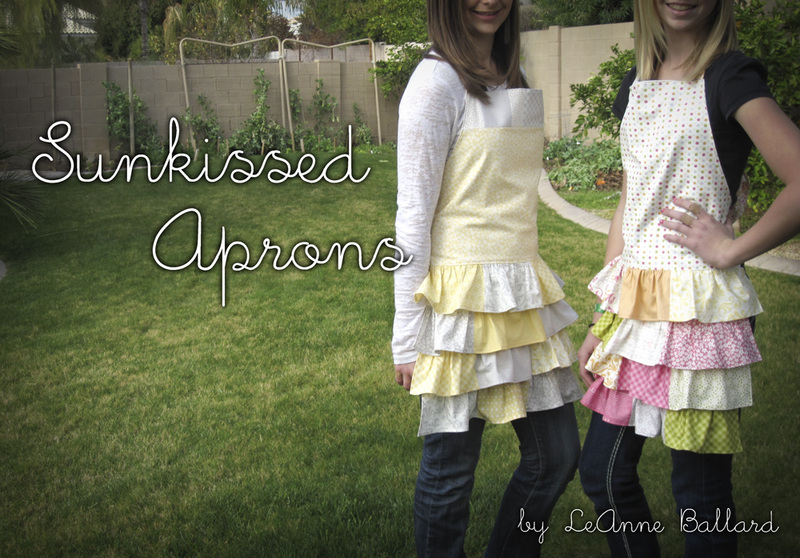 With all the baking going on around here, it is about time to make some aprons! The great thing about this project is you can pick whatever fabric line you love to make aprons that fit your personality. One layer cake will yield at least four aprons. Or, since only 10 squares are needed, use some leftover layer cake squares from a previous project. 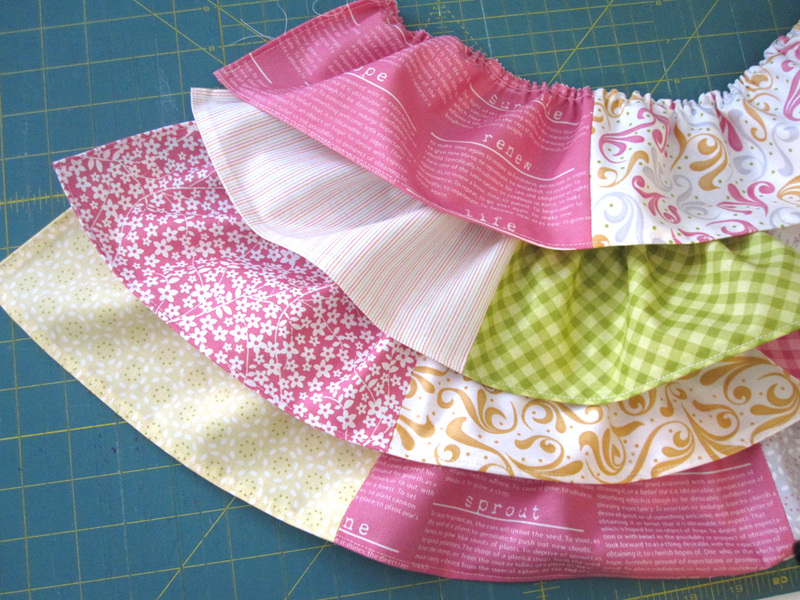 Whatever layer cake you decide to use will result in a darling apron that will make you want to get baking in the kitchen or the sewing room! Pattern piece, found in the Printer Friendly Version. Make sure ‘auto scale’ and/or ‘shrink to fit’ option ARE NOT SELECTED. 1. 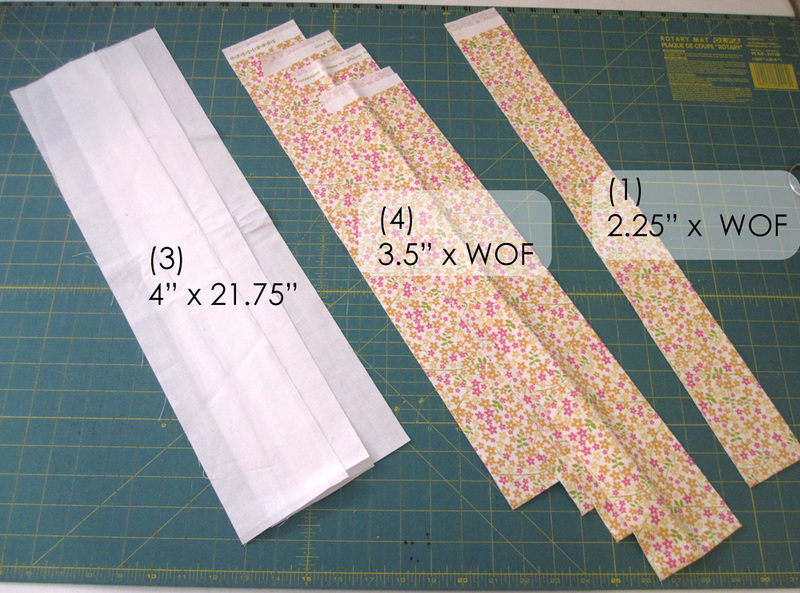 Unfold your 3/4 yard of fabric. 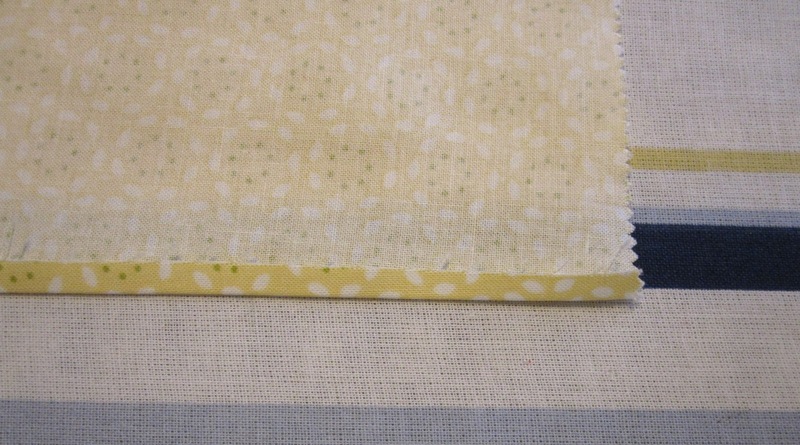 Fold one selvage to the middle of the fabric. 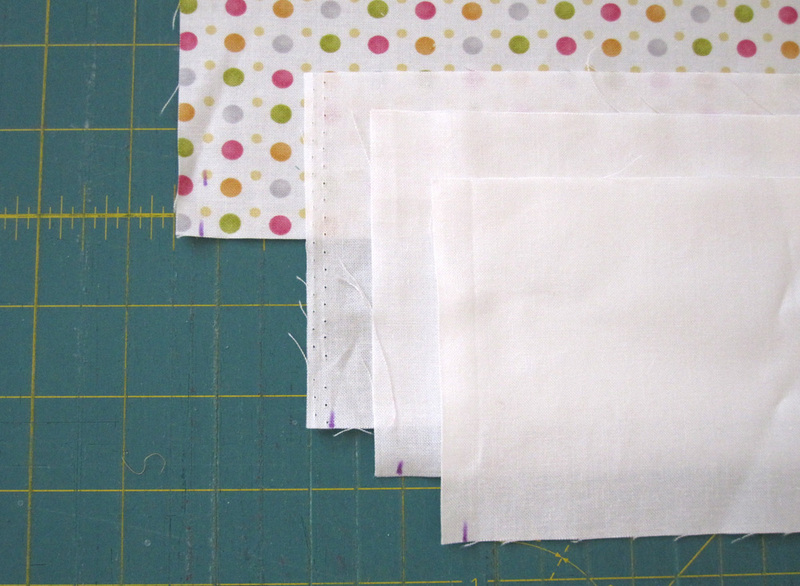 (Make sure it is the EXACT middle or you may not have enough for the lining.) 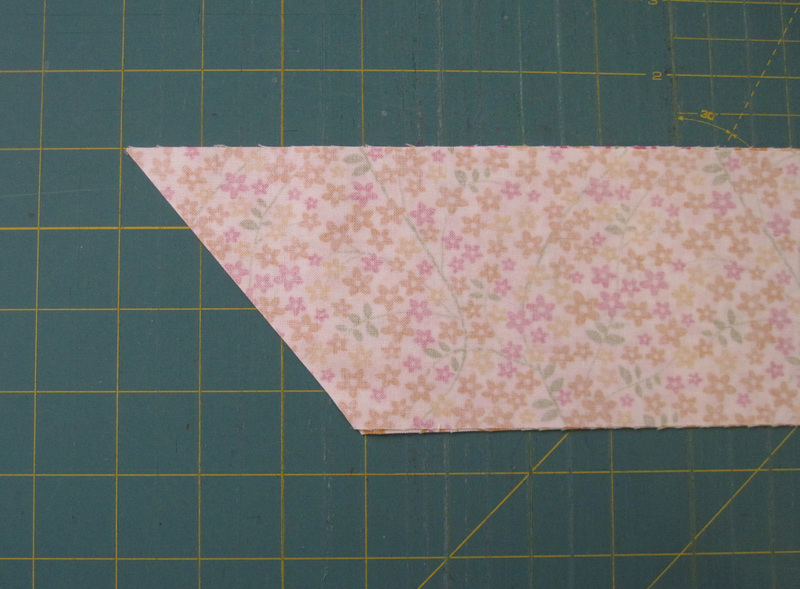 Place pattern piece on the fold and cut. This will be the ‘front’ of your apron. 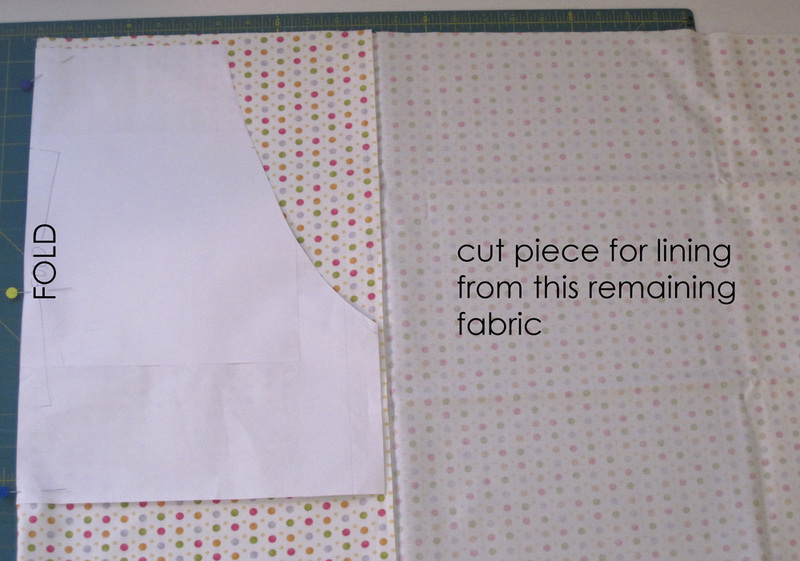 You will cut the lining from the remaining fabric shown in the photo. 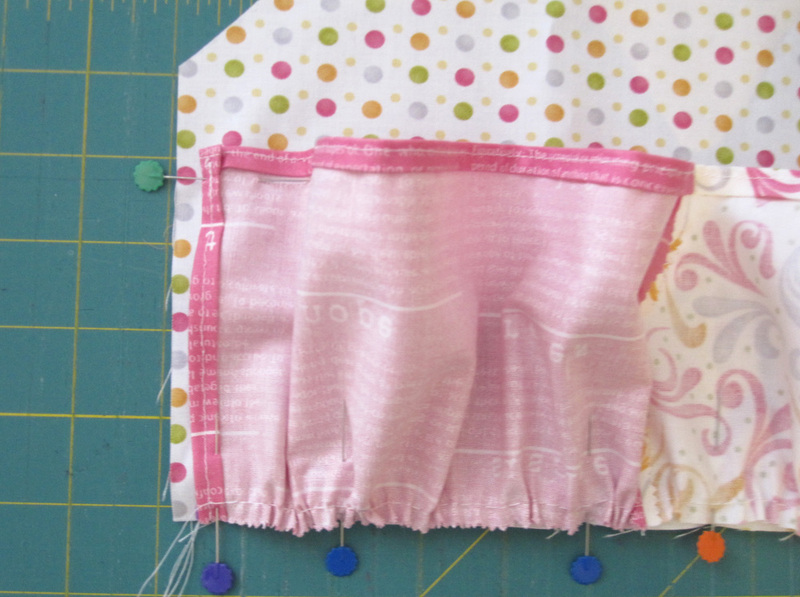 Sew the pieces RST end-to-end using 1/4″ seam allowance. The length of this piece should be about 13.5″. Press seams open. 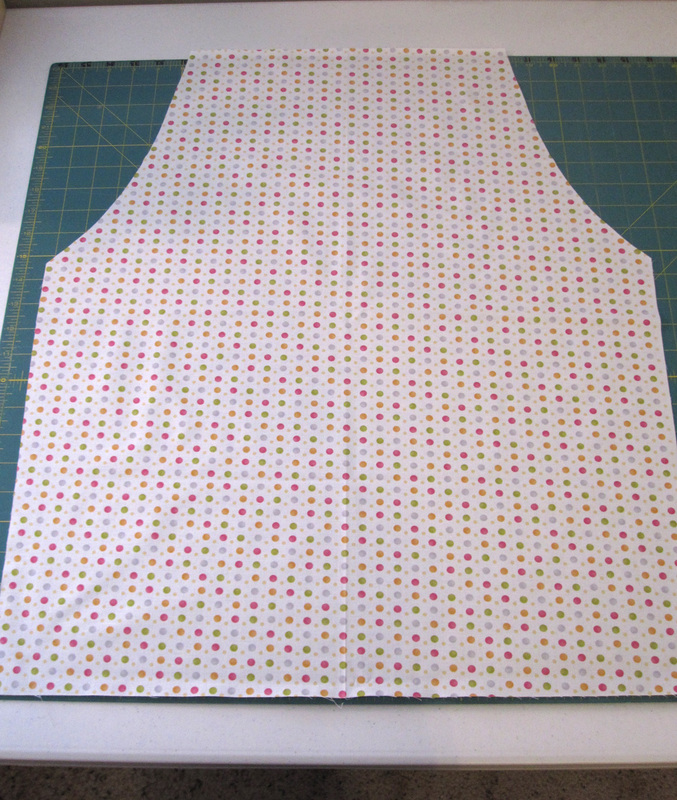 Sew this piece to the top edge of the apron front using 1/4″ seam allowance. Press seam open. 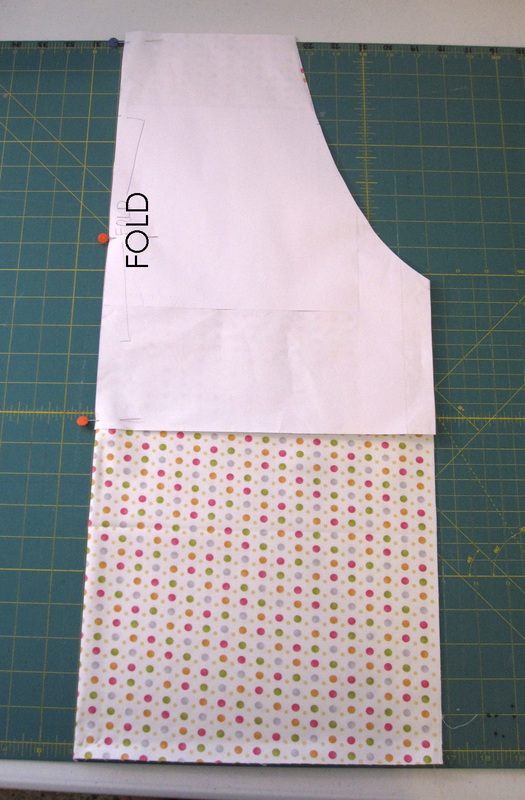 To curve the edge of this new piece, fold the apron front in half and use the pattern piece to trim to size. 2. 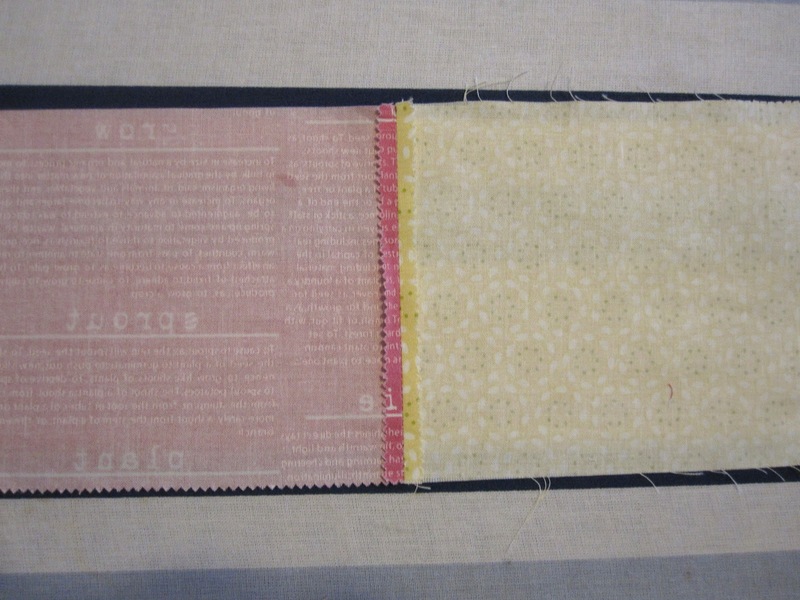 From the remaining fabric above, cut (1) 25″ long x 21.75″* wide piece. 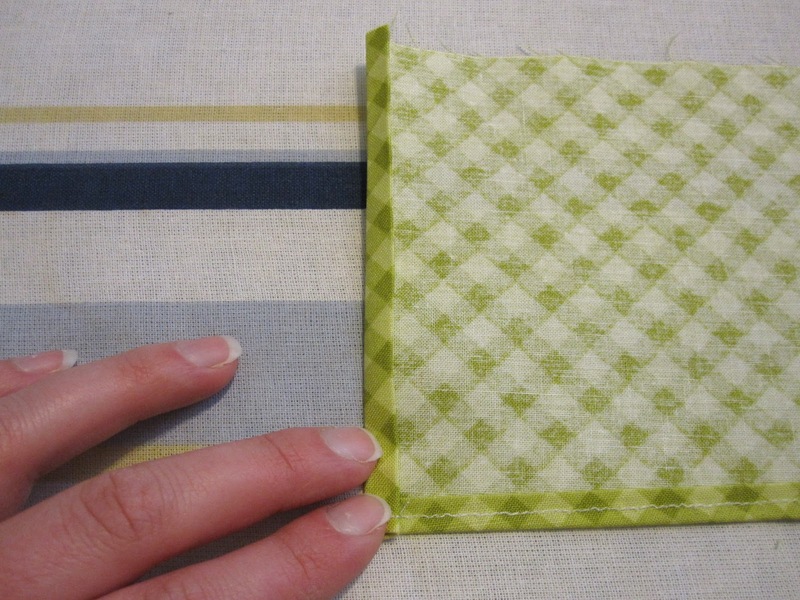 Fold in half, matching the long edges. Place pattern piece on the fold as shown below. Cut only along the curved edge of the apron as shown in the second photo below. 5. Take (2) 3.5″ x 36″ tie pieces and place RST. (Pressing helps keep edges lined up.) With the two ties still RST angle one end of the tie as shown below. Repeat for remaining tie. 6. 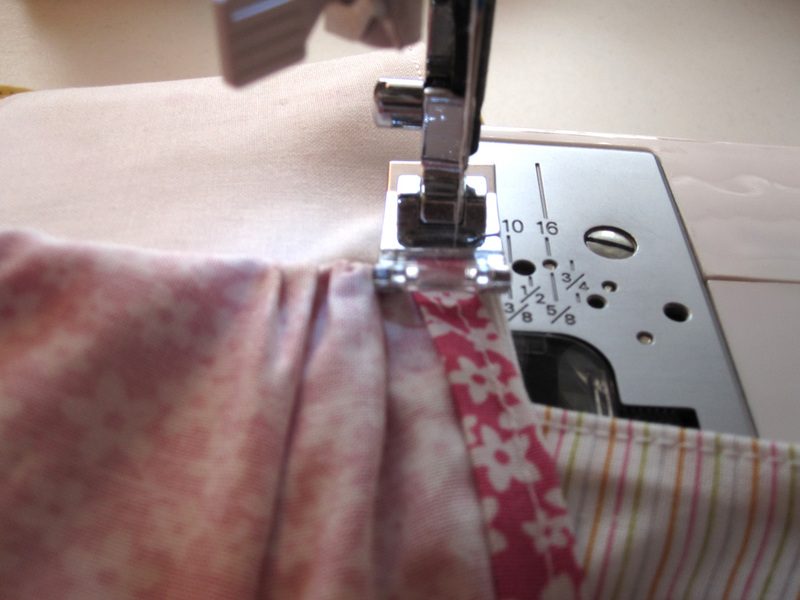 Sew the tie RST using 1/4″ seam allowance. Leave the not angled end open for turning. Clip corners at the angled end of the strap. Turn right side out and press. Repeat for remaining tie. 7. Topstitch around the tie about 1/8″ away from the edge. (I did not topstitch the opening.) Repeat for remaining tie. 9. 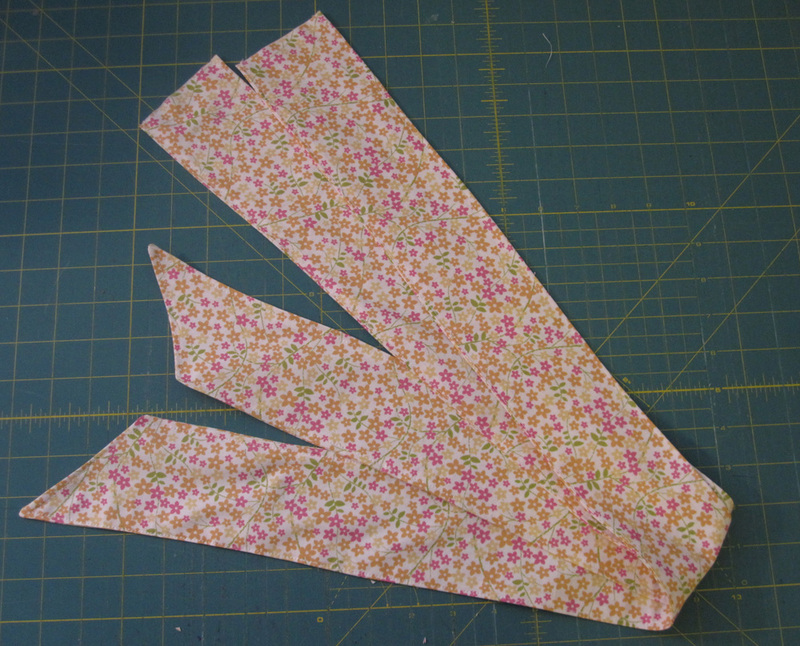 Fold the strap in half lengthwise and press to crease. 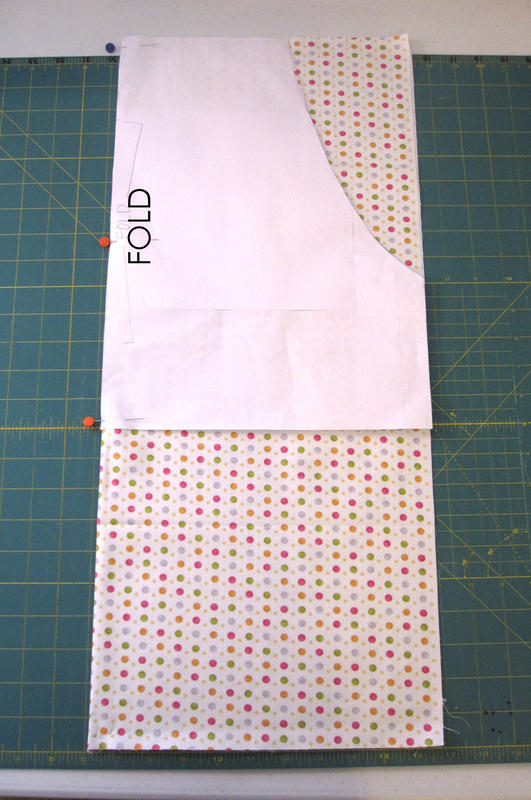 Unfold the strap and fold one long edge to the center crease. Press. Repeat for the other side. 11. 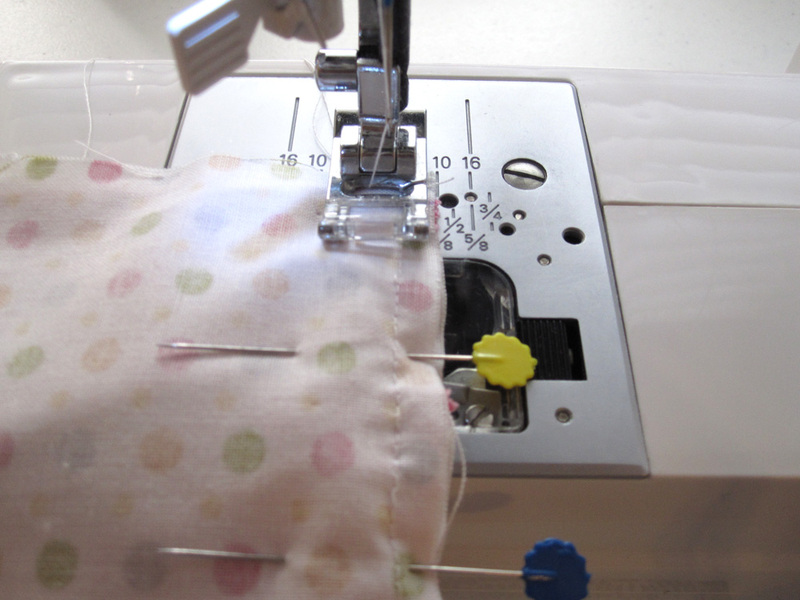 Sew the strap closed by starting at the end that you folded under. 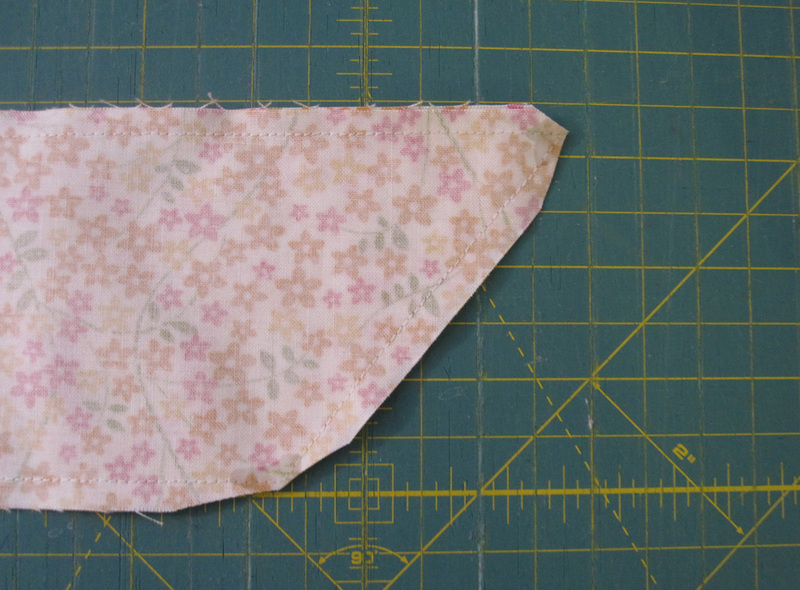 Start sewing away from fold and continue down the open side of the strap. Backstitch at the beginning and end. 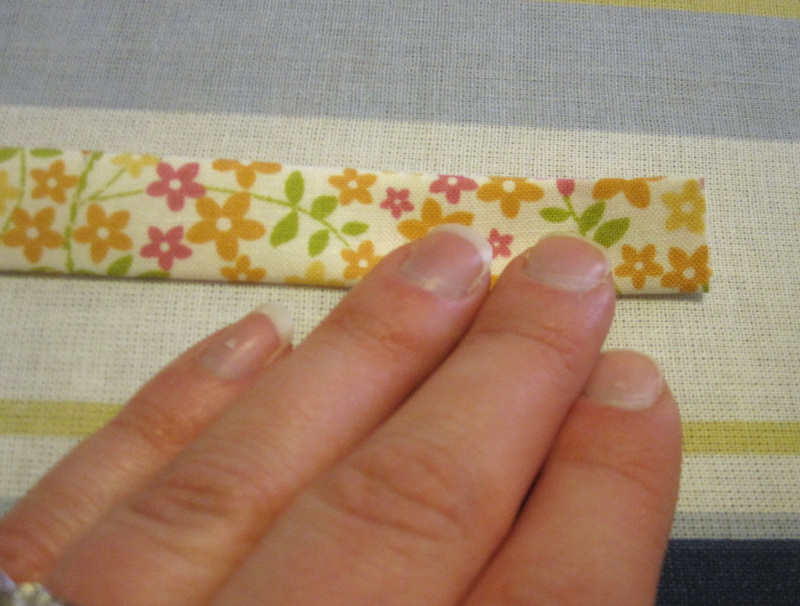 (Basically I didn’t sew down the folded edge of the strap.) Repeat steps 8 -11 for the other strap. 12. Select 8 – 10 Layer Cake Squares. Cut in half so they measure 5″x10″. 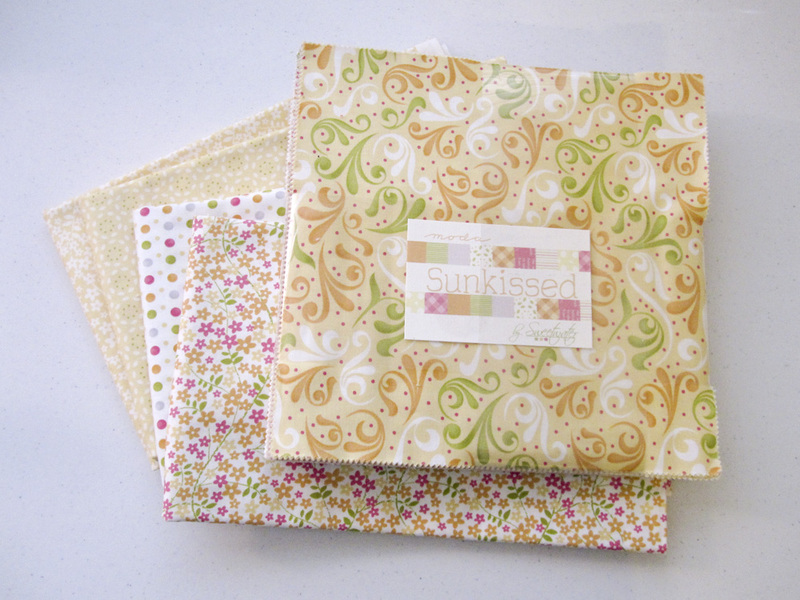 (You will only need 16 5″x10″ rectangles, so you can either choose 8 Layer Cake squares and use each print twice, or choose 10 Layer Cake squares to have a little more variety in prints.) 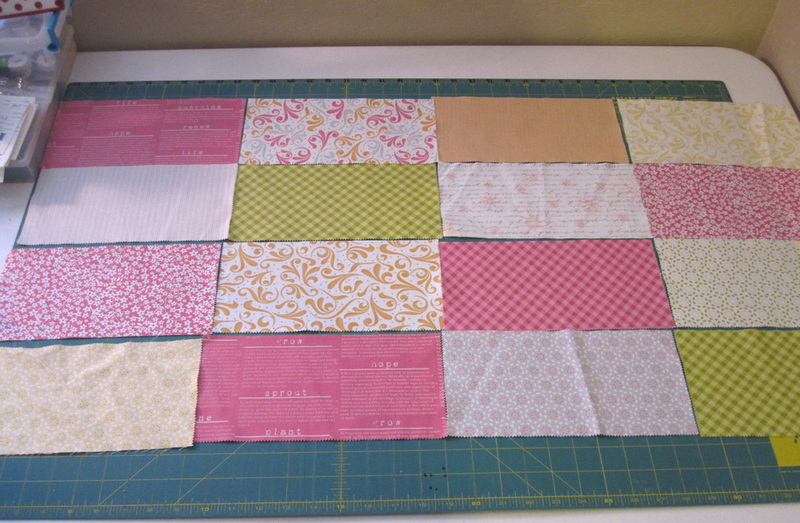 Lay out the 5″x10 rectangles in four rows of four to help you determine which prints you want to make up each ruffle strip. 14. 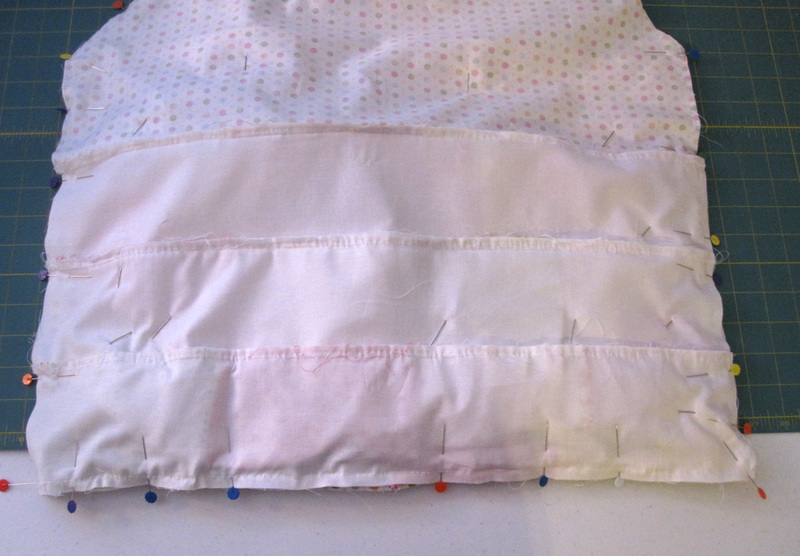 Turn under the bottom edge of ruffle strip 1/4″ and press. Repeat. 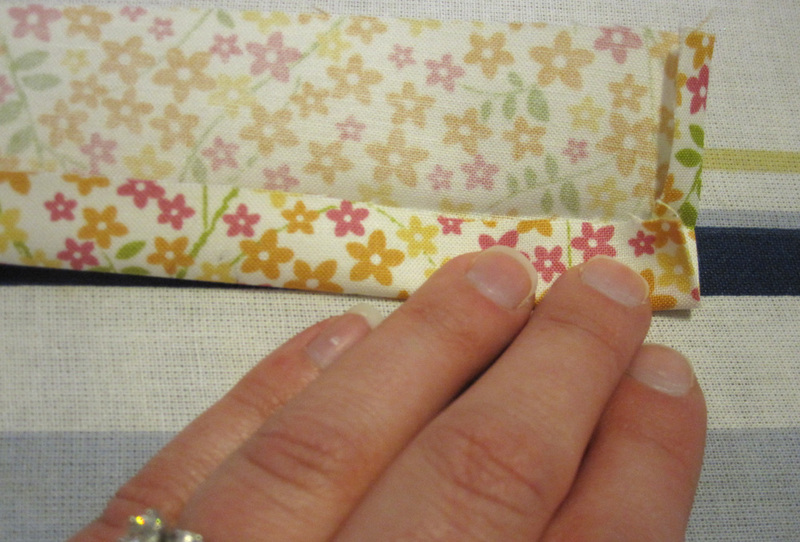 Sew folded edge in place. 15. 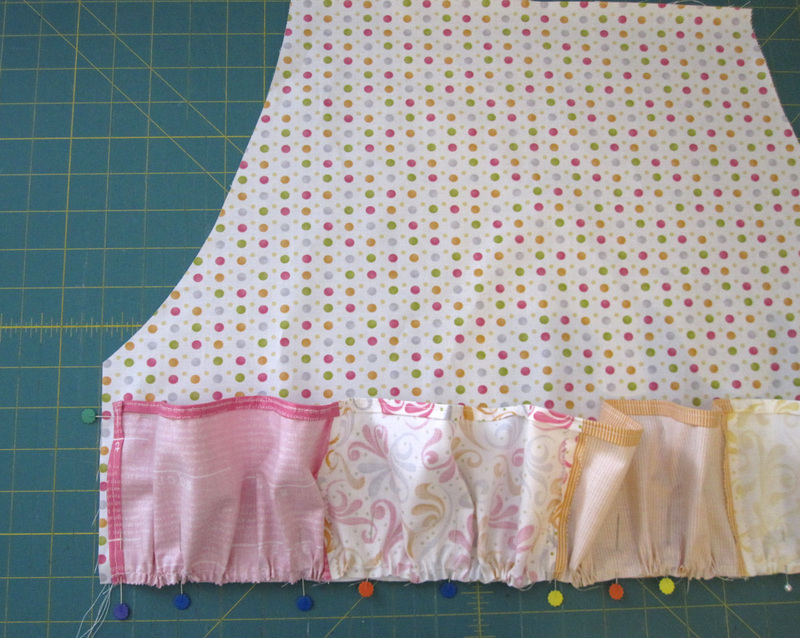 Turn under the short ends of each ruffle strip 1/4″ and press. Repeat. 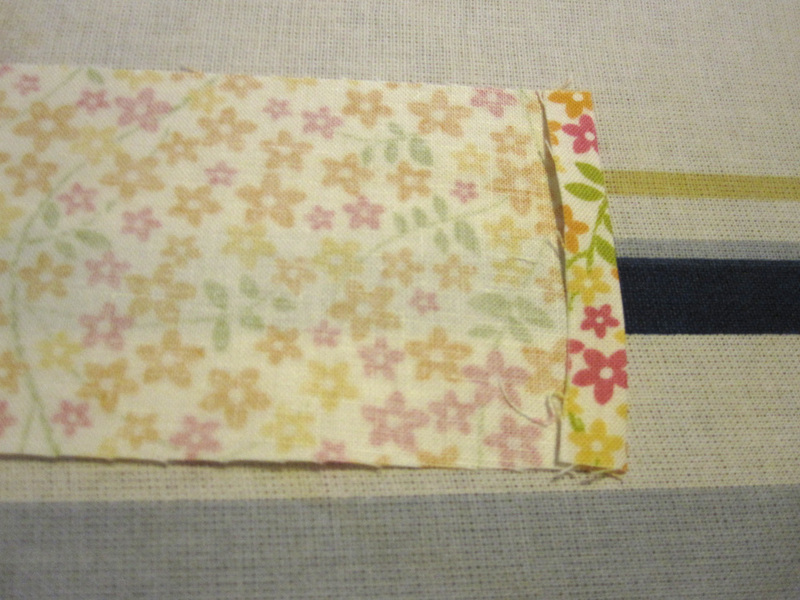 Sew folded edge in place. 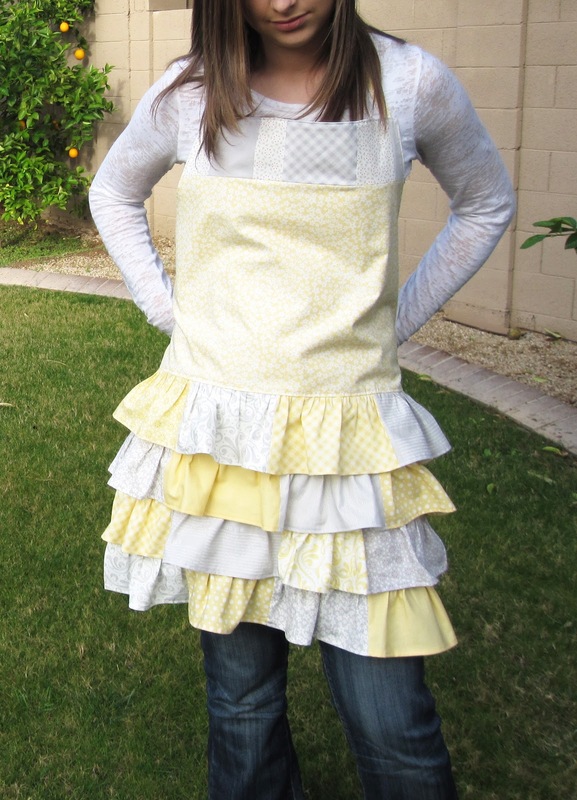 Repeat steps 14 – 15 for all the ruffle strips. 16. Ruffle the top edge of each ruffle strip using the method of your choice. (Ruffle about 1/8″ away from the edge.) Need help with ruffling? Check out my tutorial here. Repeat for all the ruffle strips. 18. 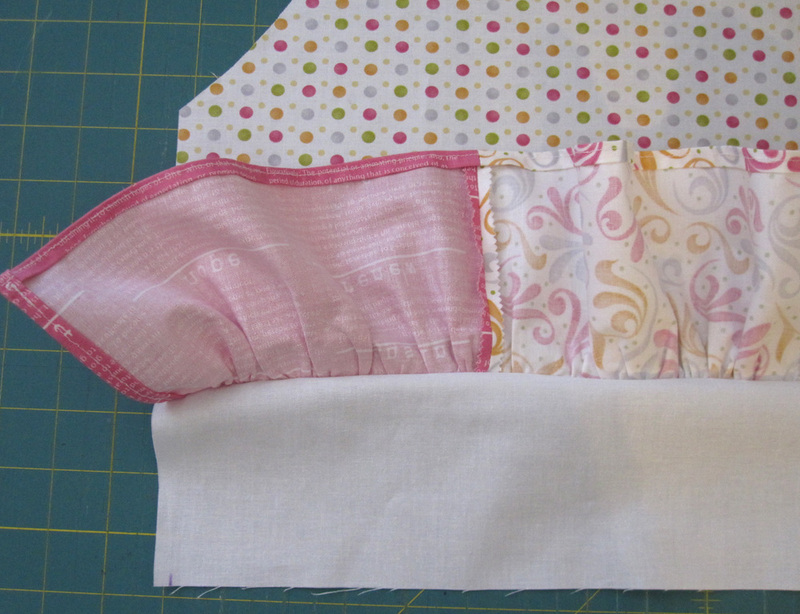 With the right side down, pin one ruffle strip to the bottom edge of the apron front. 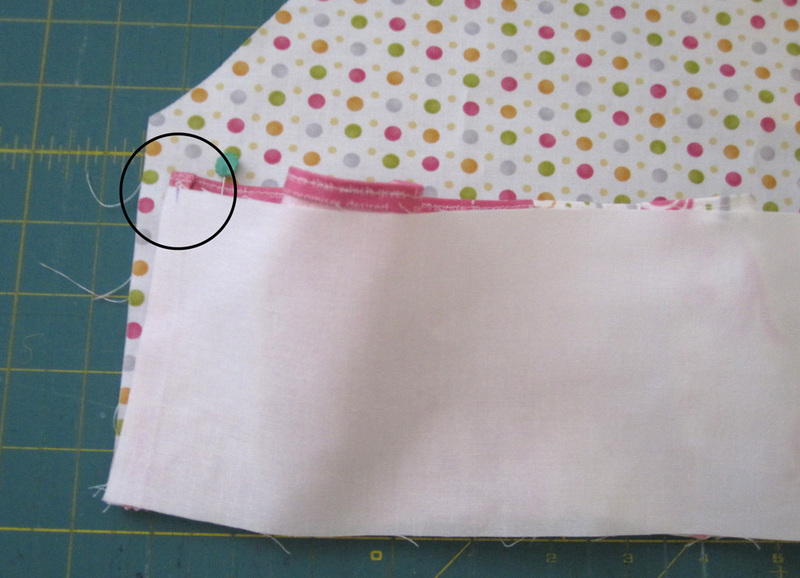 Use the mark you made above to place the ruffle strip 1/4″ away from the edges of the apron front. 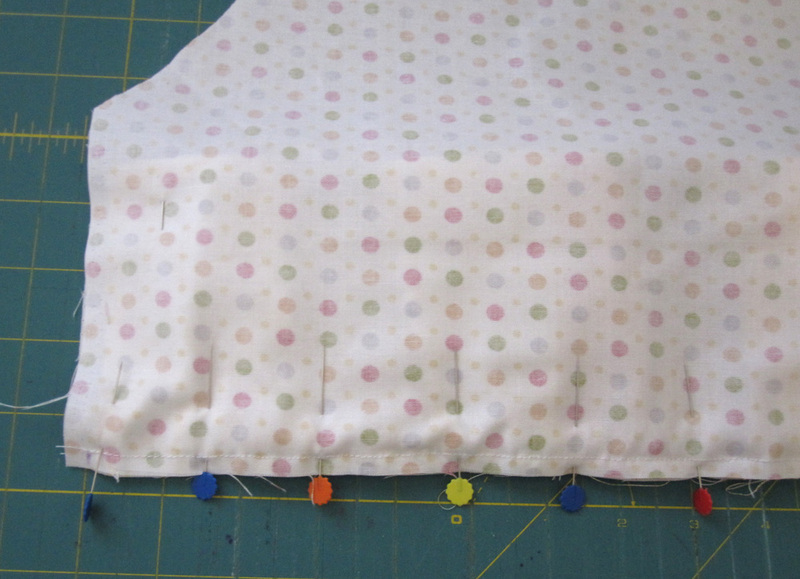 I like to place a pin at the bottom of ruffle strip to keep the strip nice and straight. (See green pin in the second picture.) Sew ruffle in place 1/8″ away from the edge. 21. Sew just beyond the stitching line from sewing on the ruffle, about 3/8″ from the edge. Backstitch at beginning and end. Press seam up towards the top of the apron. Topstitch the seam in place. 22. 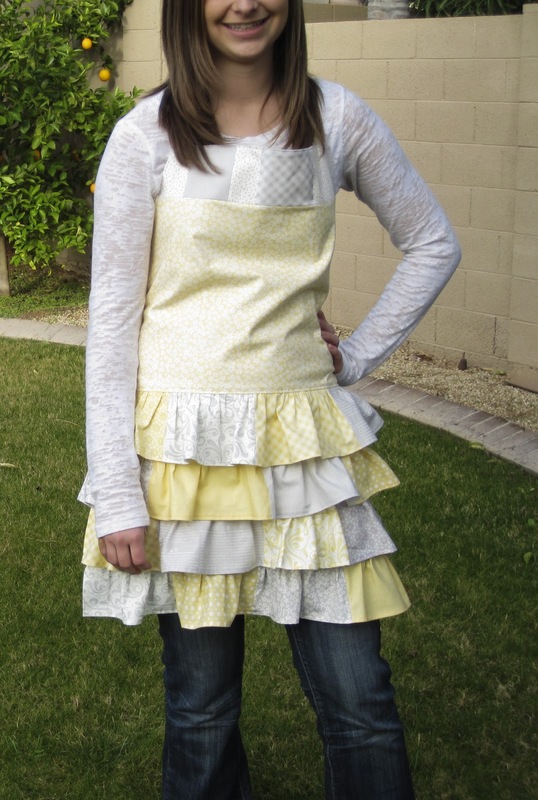 Turn the ruffle to the top of the apron. You will now see the under ruffle piece. 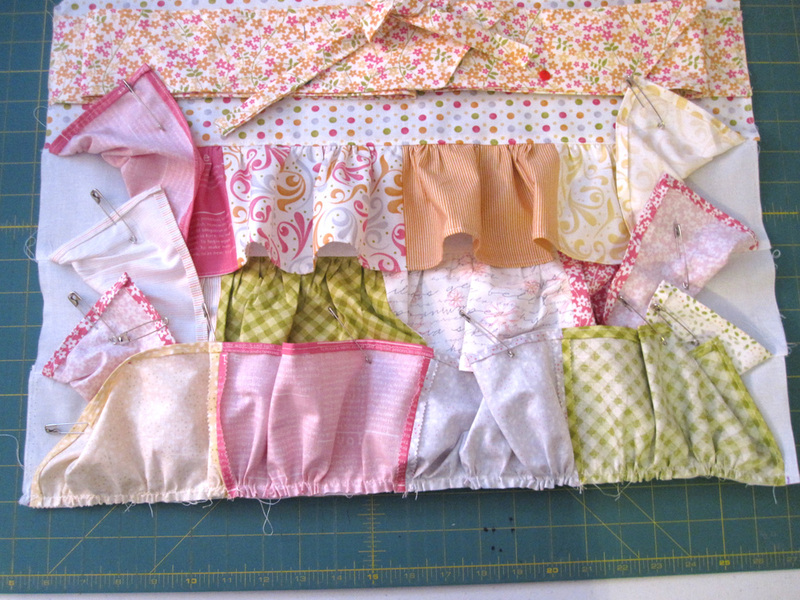 Place another ruffle strip right side down and repeat steps 18 – 21 for remaining ruffle strips/under ruffle pieces except for the very last ruffle strip. 23. When you add the last ruffle strip, you will only repeat step 18. 25. Mark 1/4″ in along the top edge of the apron. Line up the edge of a strap with the mark and pin. 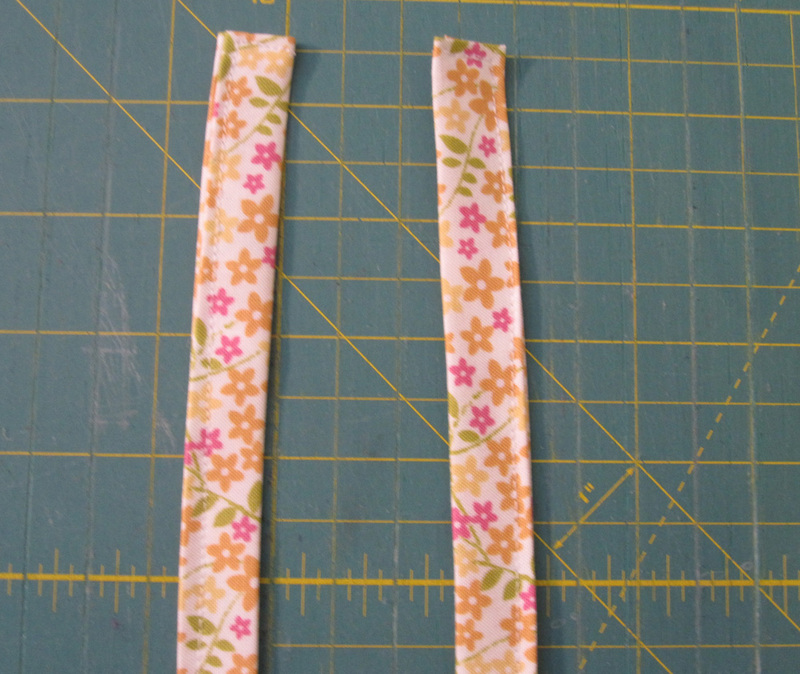 Baste strap in place with 1/8″ seam allowance. Repeat on the other side. 26. 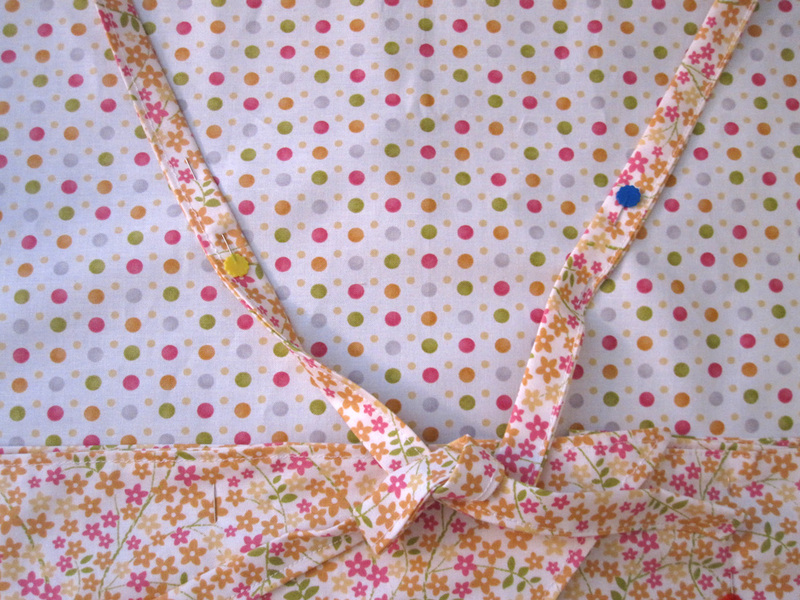 Since this apron is lined, pin the straps to the middle of the apron to keep in place. 27. 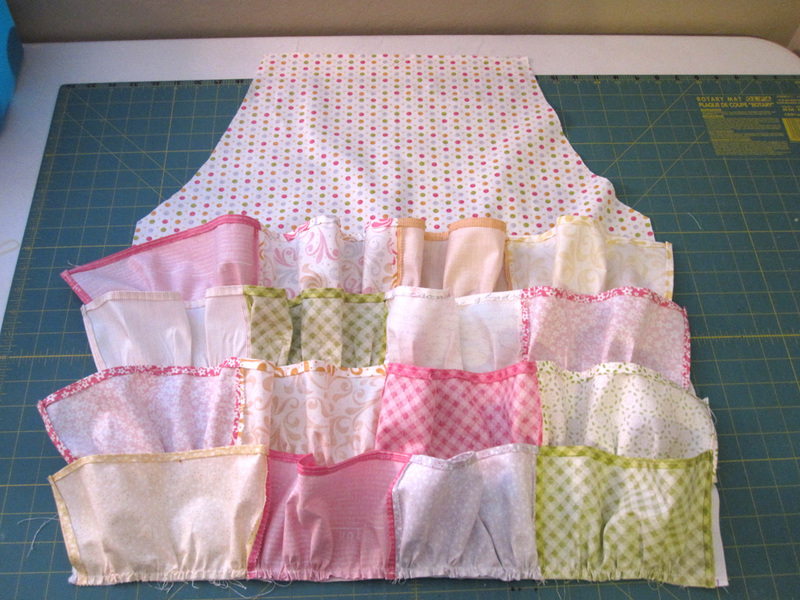 Using basting pins, pin the ruffles away from the edges and to the center of the apron. 28. Place the lining and the apron RST and pin from the back. 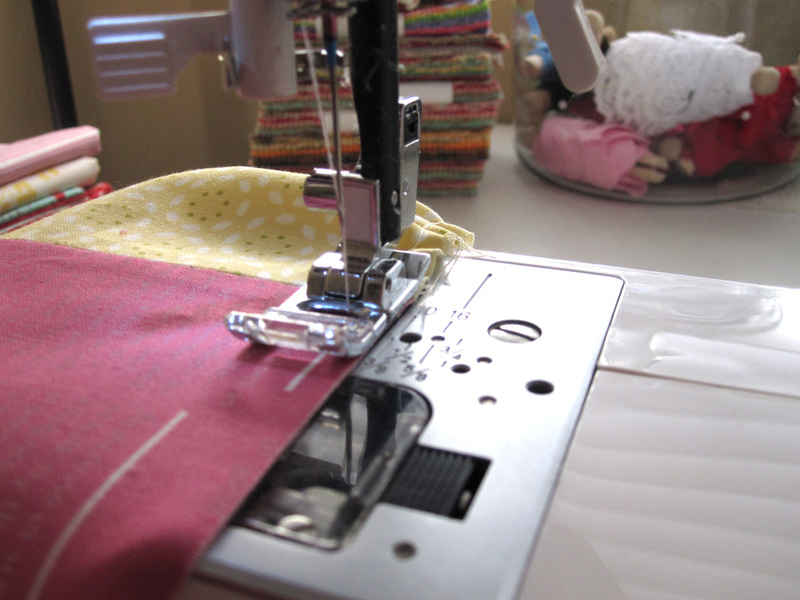 (Again, I like to sew from the back so I can watch my stitching lines.) 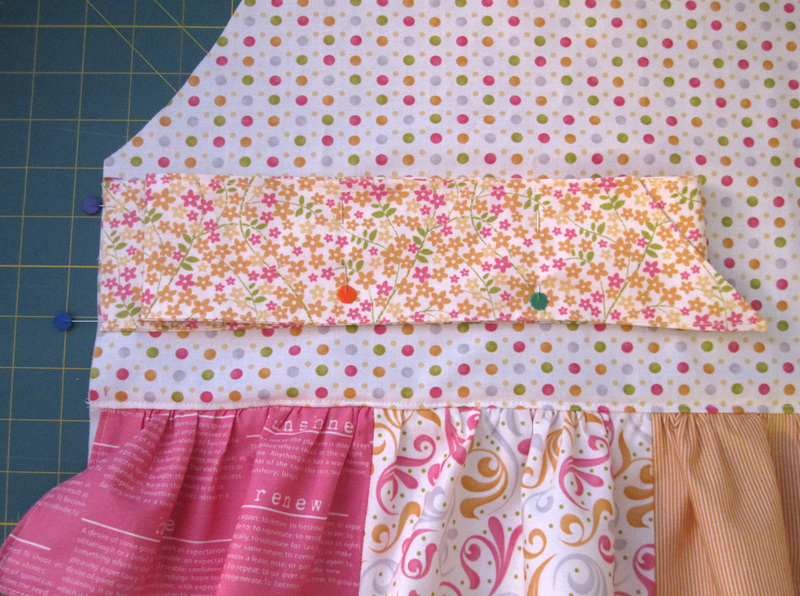 Sew the apron together using 1/4″ seam allowance. Leave an opening along the bottom for turning. 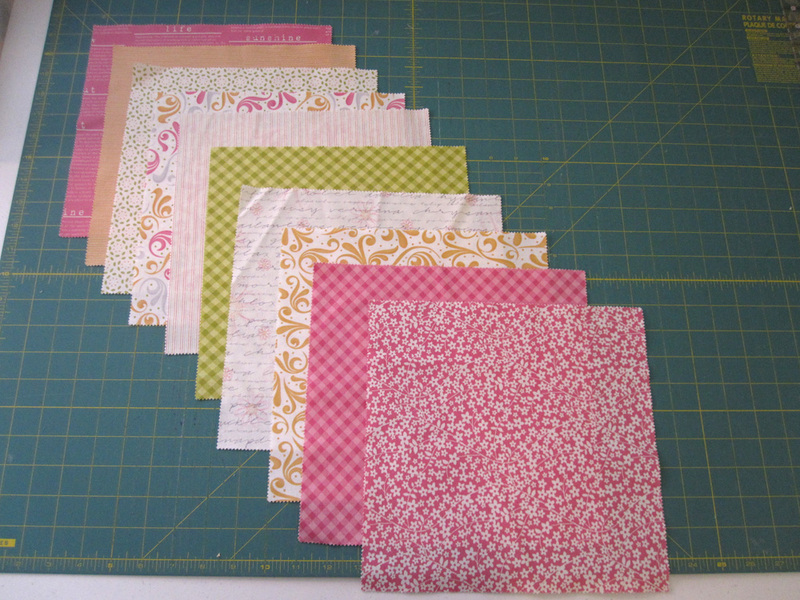 After sewing, press, clip corners, and turn. Remove all pins. 29. 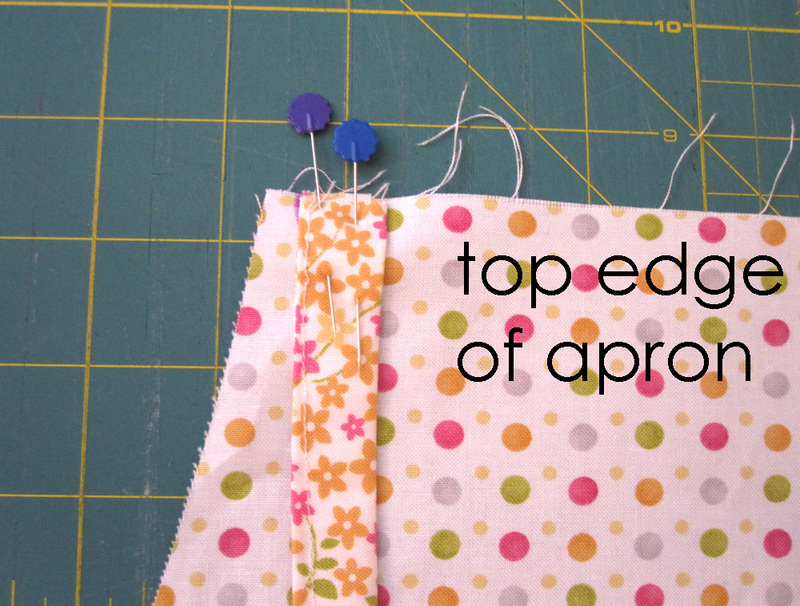 Topstitch beginning along the bottom edge, making sure to close the opening. Continue top stitching around the rest of the apron. When you get to a ruffle, backstitch, stop sewing then remove apron from machine. 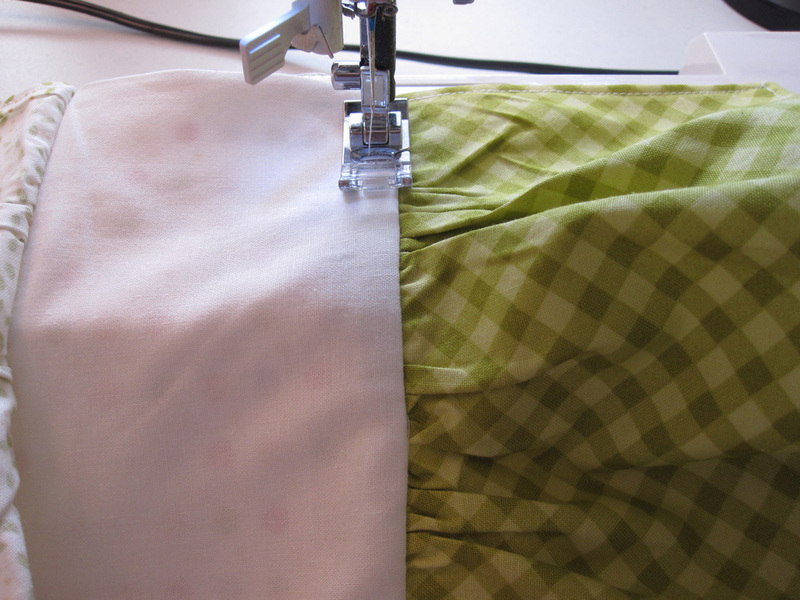 Clip threads, return apron to the machine, and begin sewing after the ruffle. This entry was posted in Accessories, Apparel, Layer Cake, Moderate and tagged Everyday Celebrations, Sunkissed, Sweetwater.